Recipient of Magsaysay Award, and lots of respect and praise from patients, community and all stakeholders in the society, Dr Adeeb Rizvi is a pioneer in treating kidney related diseases in Pakistan. 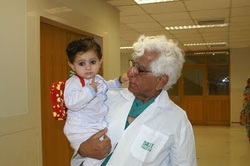 He started off very humbly by just a ward in the Civil Hospital Karachi where he treated kidney patients. This 8 bedded ward was established in 1971 and today it has grown into a full-fledged institution called SIUT (Sindh Institute of Urology and Transplantation). Dr Adeeb Rizvi worked day and night for decades and has come a long way in developing his institute as a leading urology and transplantation facility in this region. He and his team have worked with dedication to provide complete medical care from treatment to medicine, surgery and post-treatment care complete free of cost. They have a history of treating the elite in the society and have asked for their support in return for their services. Such is the dedication of this amazing Pakistani that despite all the odds against him, he has been able to provide best medical care to the poor and deserving.